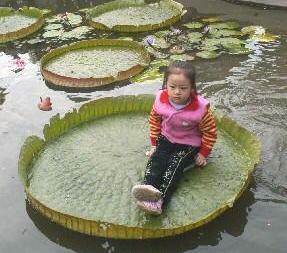 Victoria Amazonica is the biggest of all the lotus plant found in the world today! With an amazing leaf which is flat round shape with vertical edge to form a plate, its diameter can easily measured at 1.5 to 3.0 meter and capable to carry load up to 12 kg if there is no hole or damage to the leaf! Upper surface of the leaf is smooth, but bottom surface that contact with water is covered by large and sharp spines. Victoria Amazonica is native to the shallow waters of the Amazon River basin, such as Oxbow lakes and Bayous. Victoria Amazonica is night blooming. The pineapple-like fragrance in the afternoon and evening signals the blooming of first night flower, which is huge and white color in the first night. The second night of the flower turn its color to cotton candy pink or to ruby red depending on the individual plant! This entry was posted on Monday, August 7th, 2006 at 8:33 am	and is filed under Funny Junk. You can leave a response, or trackback from your own site.